Effective use of water in industrial environments requires specific treatments to control fouling, corrosion and scale processes. 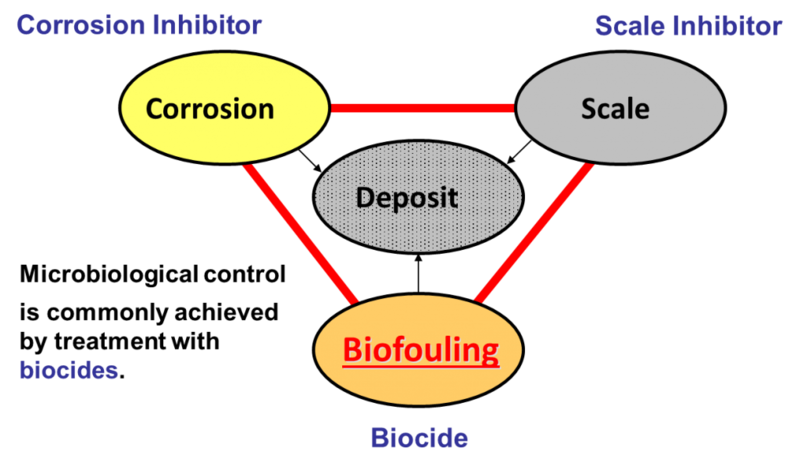 Microbiological fouling, a special and difficult-to-control form of fouling, contributes to both corrosion and scale processes. Effective control of microbiological fouling (or “biofouling”) is essential to all critical aspects of industrial water treatment. 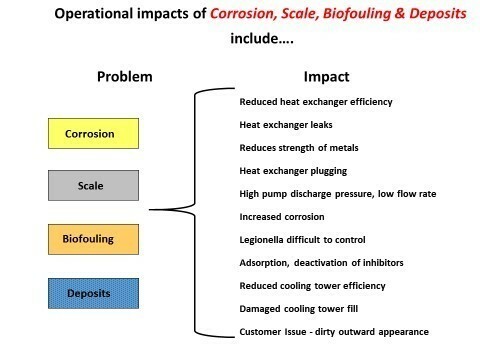 To understand why controlling biofouling is key to industrial water treatment, it is necessary to understand why and how biofilms form in industrial systems and the impact of biofilms on the performance of industrial processes. 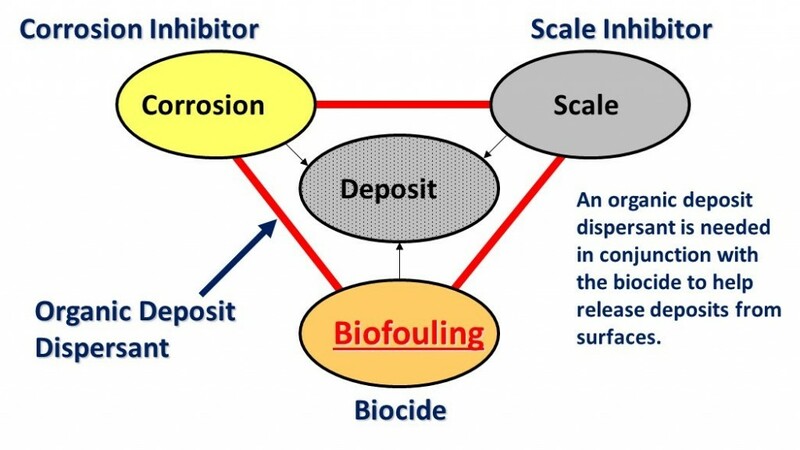 Biofouling is the macro-scale result of the formation of bacterial biofilms. Biofilms form when planktonic (“free-swimming”) bacteria in the process or cooling water collide with and stick to equipment, piping or product surfaces. Once attached to a surface, biofilm bacteria reproduce and release extracellular polymers which protect the organisms within the biofilm, attract nutrients and other planktonic bacteria to the biofilm, and restrict the diffusion of dissolved compounds and gasses into and out of the biofilm. Watch the Biofilm Control Program video to better understand the main concerns in industrial water treatment and their interrelationship. 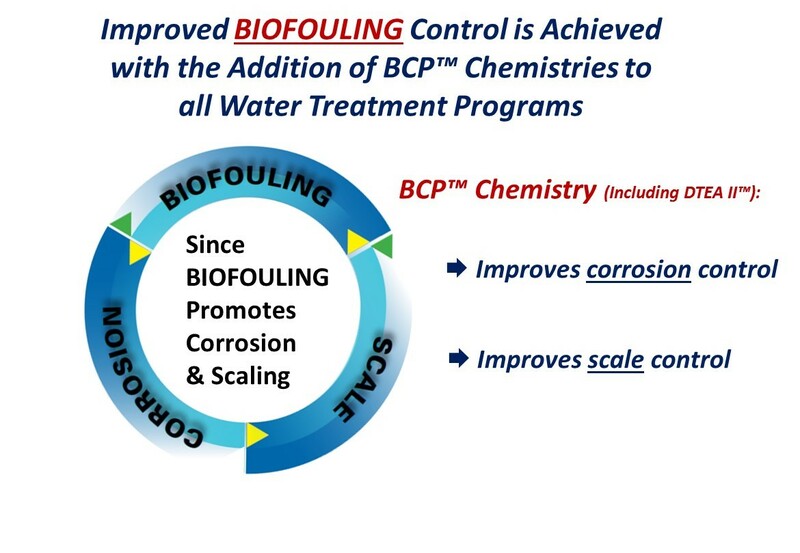 Effective biofouling control and ultimately a complete water treatment is facilitated with BCP™ products. 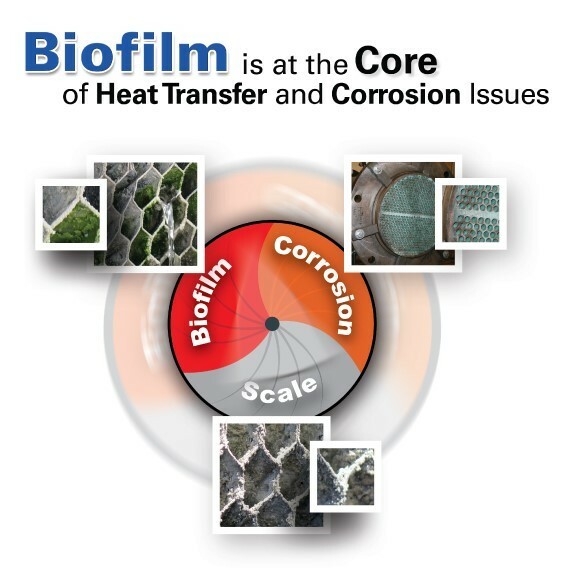 (To learn more about biofilm and its formation, see Biofilm Basics on the Montana State University Center for Biofilm Engineering http://www.biofilm.montana.edu/biofilm-basics.html). 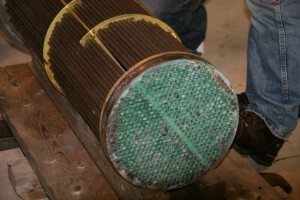 Bacterial activity within the biofilm can accelerate corrosion of the surface to which the biofilm is attached (a process known as microbially influenced corrosion, or MIC). A combination of biofilm chemistry and the activity of bacteria within the biofilm can limit the solubility of compounds which ultimately initiate mineral scale formation on equipment surfaces. 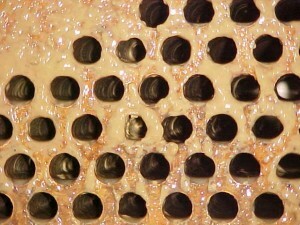 The presence of biofilm on a surface restricts flow immediately adjacent to the surface, limiting heat exchange from the surface beneath the biofilm with the bulk water above the biofilm. The insulating effect of biofilm is significantly greater than the insulating effect of carbonate mineral scales. 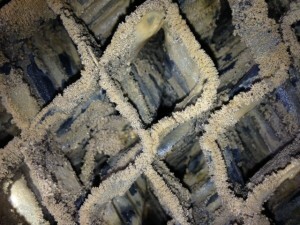 Biofilm with embedded scale in cooling tower fill and biofilm in a condenser. Bacterial control in industrial water systems traditionally has been based on the application of biocides – toxic chemicals designed to kill planktonic bacteria in the recirculating water as illustrated by the standard water treatment triangle shown on the right. With increased knowledge of biofilm growth in industrial water systems, it is now understood that bacteria within the biofilm are protected from biocides dosed into the recirculating water. Treatments that are highly effective in controlling planktonic bacterial growth in the recirculating water are much less effective in controlling the same bacteria residing in biofilms in the same system. Increasing biocide dose concentration to achieve more effective kill of biofilm bacteria significantly increases treatment program cost, and raises toxicity concerns for both on-site personnel and for the discharge environment. It is possible to increase the effectiveness of biocides against biofilm bacteria by penetrating the chemical and physical defenses of bacteria in biofilms. Organic deposit dispersants — chemicals which penetrate and disrupt biofilms — allow greater exposure of biofilm bacteria to biocides dosed into the system, resulting in reduced bacterial activity in the biofilm, and destabilization and removal of biofilms from critical equipment surfaces. Coordinated application of an effective organic deposit dispersant such as AMSA’s BCP™ 1015, (DTEA II™) along with a good industrial biocide can be used to remove existing biofouling deposits, and prevent the formation of new deposits. This Clean it Up and Keep it Clean!™ approach will result in improved and more cost-effective biofouling control, and enhanced corrosion and scale control. A cleaner system operates more efficiently, experiences less downtime, and typically has fewer problems with corrosion-causing bacteria such as SRB (sulfate-reducing bacteria) and APB (acid-producing bacteria), and pathogens such as Legionella. Contact AMSA today for more information about how AMSA BCP™ chemistries can increase your operational efficiency and your cost savings!